Got a sweet tooth? I do too. Sometimes only pastries can satisfy my craving for something sweet, but I don't always have the time to stop by a bakery for a quick pick-me-up during the day. What's a girl to do? I recently came across a monthly subscription box company based out of Winnipeg which delivers locally baked goods right to your doorstep. 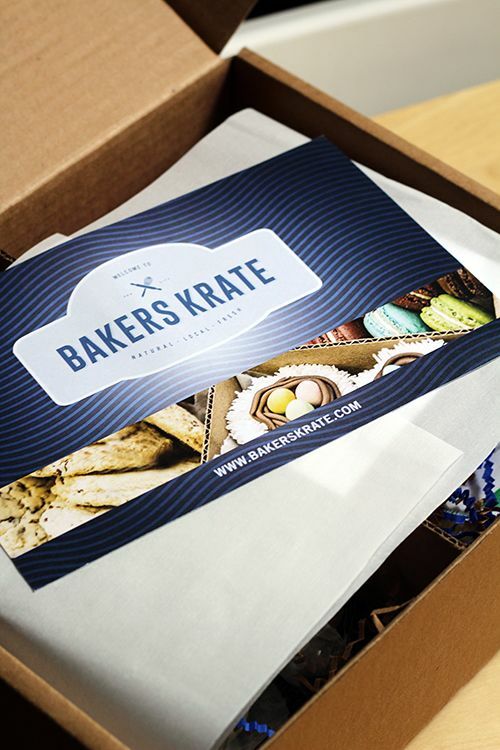 Bakers Krate promises to deliver gourmet, artisan baked goods straight to your door every month. Forget the makeup and dog treat subscription boxes, food is where my attention is. So how does it all work? Bakers Krate offers three options for you to get your goodies. The Original Bakers Krate ($19.98) has 6+ desserts, and the Bakers Krate Jr. ($15.99) offers 6 mini desserts in the box. Both options include shipping and unfortunately are only available to residents of Winnipeg. The Bakers Krate Express ($19.99) on the other hand holds 6+ desserts and can be shipped across the country for a rate of $9.99. I received the August Bakers Krate Express, and inside was an assortment of 6 goodies from two different bake shops in Winnipeg. From Cake-ology came a Raspberry Imperial Cookie, Saskatoon Imperial Cookie, Vanilla Cakette, and Red Velvet Cakette. A Chocolate Brownie Square and Blueberry Crumble came from Goodies Bake Shop, and every item arrived in great condition. I appreciated that there was a card accompanying the box to help me identify items, and each came with a 'best before' date to help me decide which goodies to eat first. I think it's great that there's a company committed to sending goods across the country to promote their local bakeries and baked goods! At $20 for a box of 6+ goodies, it's a fair price, but it does become a bit expensive when the expedited shipping costs are factored in. There's also the downside to not living in Winnipeg, as it would be next to impossible to repurchase your favourite items unless you were visiting the city itself. But maybe that could be an incentive to visit! While my box of items arrived in great condition, potential subscribers should also keep in mind that only a certain assortment of baked goods is likely to arrive in your box. 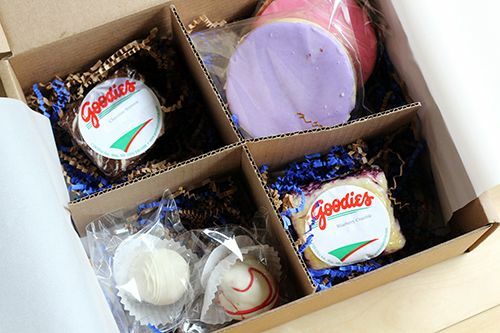 Cookies, bars, and other 'sturdy' items will likely be found in the box each month, as cakes are likely too fragile for shipping long distances. 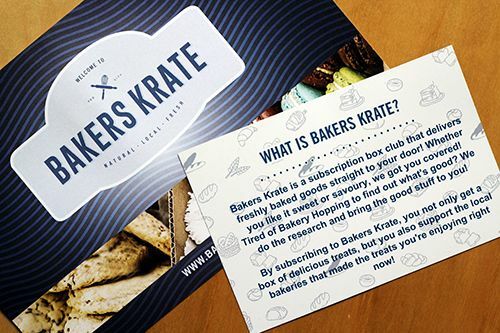 There's got to beonly a handful of bakeries in Winnipeg, so I think it would be neat if Bakers Krate started to partner with bake shops in other cities to avoid repeat items in their boxes. The box is a very unique way for local residents to discover new bakeries, and for others across the country to see what Winnipeg has to offer. If you're interested in getting some goodies delivered to your door, sign up on the Bakers Krate website and let me know what you think! 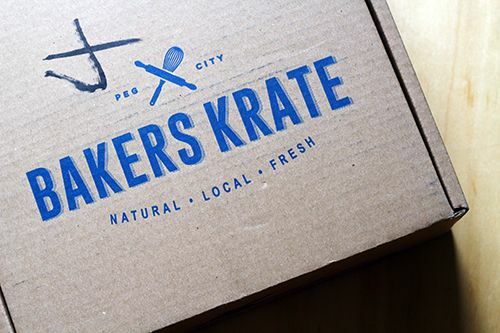 *Disclosure: the Bakers Krate was sent for consideration of a review. Views expressed in this post are solely mine, and as always, my priority is to you, the reader, to present an unbiased, thorough review. Cafes are popping up all over the city, so it can be a difficult decision when it comes to picking out the perfect spot for your caffeine fix. But if you ask me, there's one spot that's caught my attention, and you can find it inside a historic house in the quaint community of Riverdale. 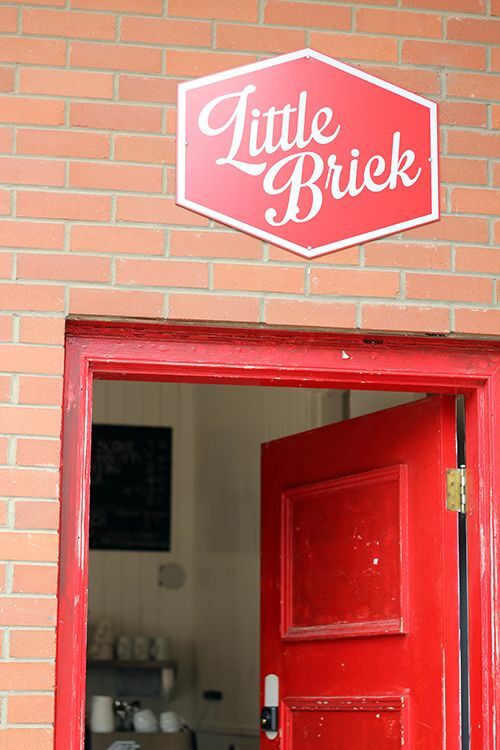 Little Brick is the newest addition to the empire of cafes owned by Nate Box, and is the little sister to Elm Cafe, District Coffee Co., and Burrow. The historic home currently occupied by Little Brick belonged to that of J.B. Little, a brickyard owner in the late 1800s/early 1900s. The home was passed from one generation to the next, until it ultimately became a storefront in the early 2000s, and later turned over for rent. Nate Box spotted the space last summer and with his business partners decided that the space had the potential to engage and fit the needs of the surrounding community. From there, Little Brick Cafe was born. Given that the brickworks industry defined the Riverdale area, it was only right to have the name of the space pay homage to that of it's original builder and inhabitant. Once you step inside the building, you're invited in by the smell of pastries and freshly brewed coffee. To the left you can find a wide variety of locally made goods in the general store. 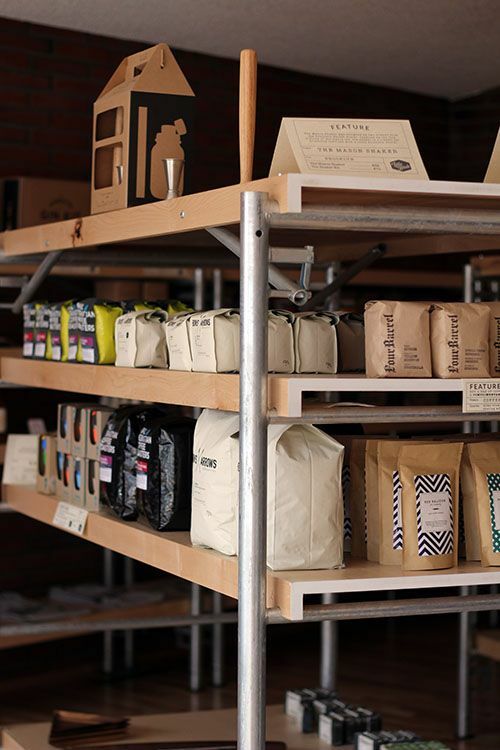 The shelves carry coffee beans brought in from Phil & Sebastian, Four Barrel, and Bows & Arrows, and there's an assortment of coffeeware available to help you brew the perfect cup at home. There's locally made kitchenware, serveware, bakeware, and even local art available for purchase - there are so many gems sitting on the shelves waiting to be discovered, and it's great to see the support that businesses have for one another. To the right of the entranceway you will find seating in the dining and living rooms. 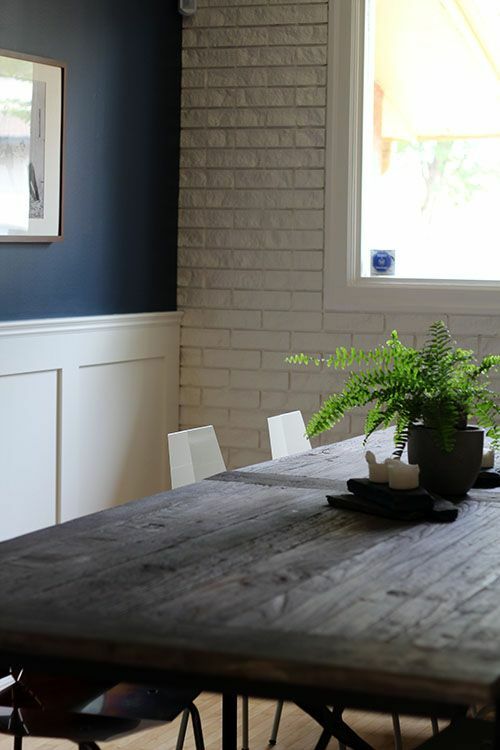 The interior of the house has been renovated to give it a modern feel, but amongst the navy blue walls and geometric chairs, distinct pieces of history like the exposed brick and fireplace in the living room remain. I stopped by Little Brick a few weeks ago after their new menu launch and was pretty excited about the new dishes available. Tartine's are becoming increasingly popular on menus these days, and Little Brick has a couple versions available. 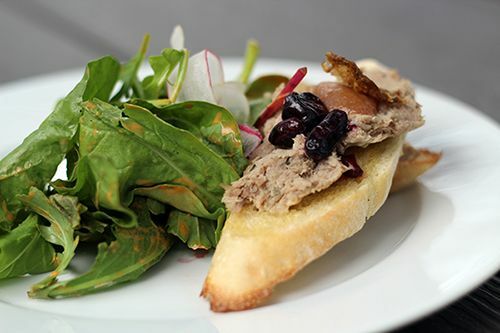 I ordered the Duck Tartine ($12) made with thyme butter and rhubarb, topped with local haskaps and served with a side salad. The duck was well seasoned, and almost pate-like in texture. The side salad was well-dressed and refreshing, and all together this dish made for a tasty light lunch option. My friend ordered the Breakfast Sandwich ($10) off the breakfast menu (which is available all day! ), which came with the same side salad I had. 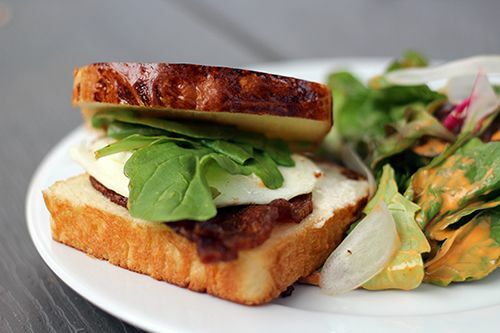 Bacon, greens, and a sunny side up egg were sandwiched between two soft slices of brioche, and made for a filling meal too. We also had a side order of the Coconut Rice Pudding ($4) made with almond milk and orange zest. To my surprise, the pudding was served warm, but it was delicious nonetheless. It was quite a comforting bowl, and I really enjoyed the strong orange fragrance with each bite. The community of Riverdale has welcomed Little brick to the neighborhood with open arms, and this cafe has definitely increased the foot traffic in the area too. 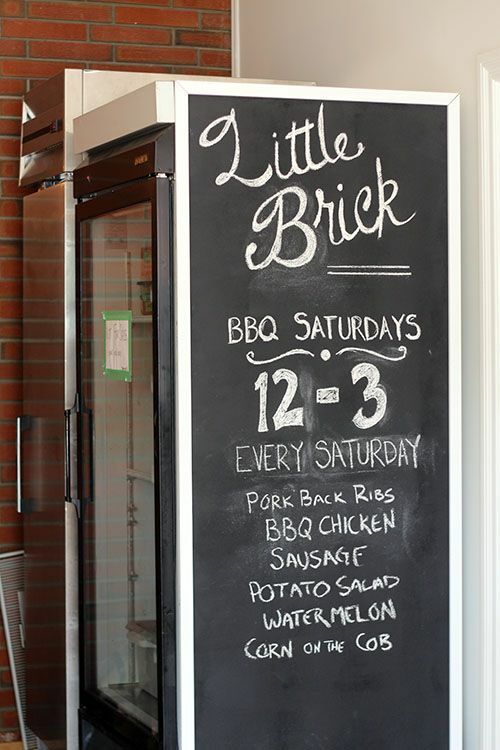 Little Brick has the capacity to host large group meetings and private events, and for the summer they have begun hosting neighborhood BBQs every Saturday afternoon. 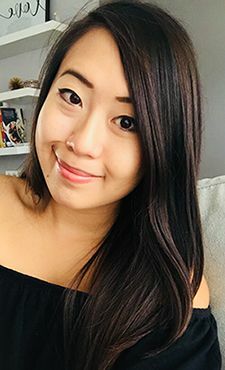 With a location close to the River Valley, ample seating, and a large backyard space to accommodate dining al fresco, Little Brick is one of my new favourite spots to visit! Stop by for some coffee or a snack, and go exploring in this neat Edmonton community. If there's one restaurant in Edmonton that does seafood right, it's Sabor (formerly Sabor Divino). For the third year in a row Sabor is hosting their annual seafood festival, which runs now through August 30. In the past year a lot has changed at Sabor for Christian Mena and Lino Oliviera, the proprietors of this downtown Edmonton restaurant. 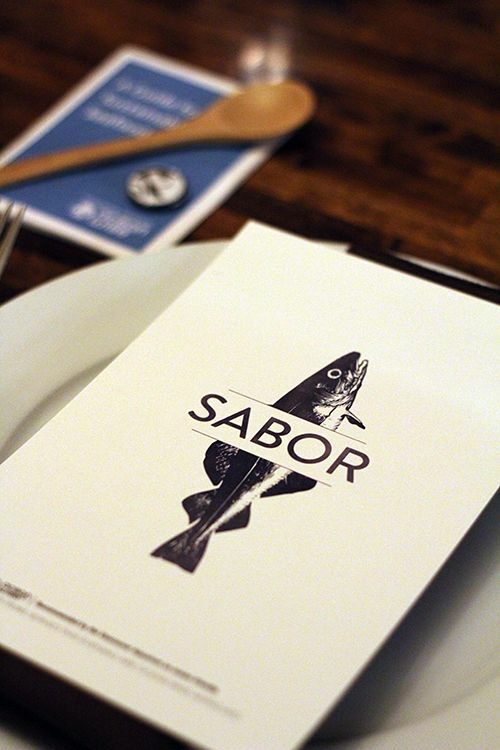 Sabor has been renamed and rebranded, their third restaurant Urbano Pizza Co. has opened next door, and Sabor has become 100% Ocean Wise approved. That's a big list of accomplishments for one year, but the Ocean Wise certification is one of the most exciting for their annual seafood festival. 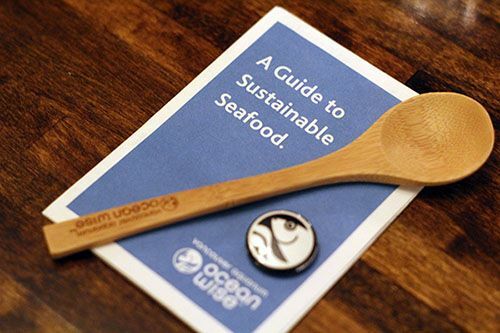 Ocean Wise is a conservation program run by the Vancouver Aquarium that exists to educate people about the issues surrounding overfishing, and to empower consumers to make the choice to eat only sustainable seafood. Ocean Wise is in it's tenth year working with restaurants to make decisions to serve ocean-friendly seafood on their menus. Recommendations are made based on factors such as the availability of seafood at different times of the year, how the seafood is caught, and management of different fisheries. By dining at restaurants that are Ocean Wise approved, you have the power to make change on an individual level. How cool is that? So what exactly does this mean for Sabor? 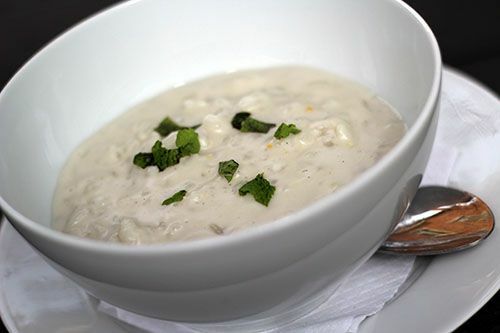 With a menu that is 100% Ocean Wise approved, you can indulge in seafood guilt-free and know that you are making a difference for our oceans. I had the pleasure of attending the kick off to this year's Seafood Festival to preview some of Chef Lino's new dishes. 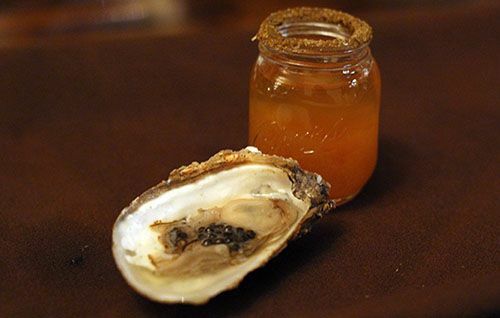 The night started off with a bang with the Sabor Caesar Shot: a Malpeque oyster topped with sturgeon caviar and served with a Caesar shot featuring Eau Claire Three Point Vodka. I love that Sabor chose to feature Eau Claire Distillery - as Alberta's first craft distillery, their spirits are sure to impress if you haven't tried them yet! 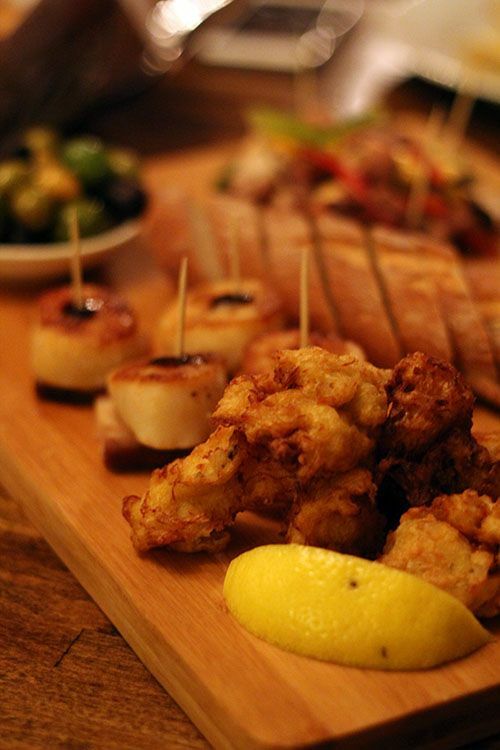 Each table was offered a Pinchos Board, featuring some of the items available on the menu at Bodega Tapas & Wine, to kick off the evening. 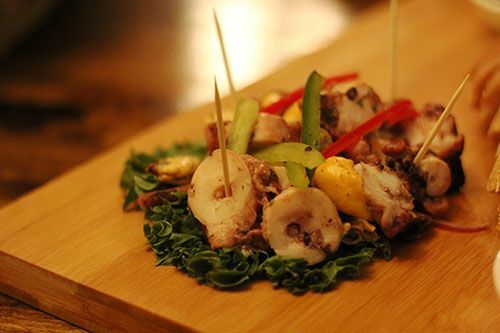 Pinchos, which are related to tapas, differ such that pinchos are often presented spiked with toothpicks. In Spanish culture, the toothpicks serve as a method of picking up your food, but also as a way to charge you for how much you've eaten. Luckily Sabor doesn't charge based on toothpick count, because I would have had to shell out a lot of money! Our board for the evening featured Sabor's Aceitonas (house marinated olives, $5), octopus and mussel salad ($6, pictured above), crab fritters, seared scallops on pork belly, and snails in red wine with chorizo. The scallops and pork belly were a hit at our table, with the crispy crab fritters a close second. Olives, octopus and snail are such polarizing dishes to begin with, so I found that at our table there was not much in-between, you either liked the dish or you didn't. Our second starter for the evening was Chef Lino's play on Fish and Chips, featuring deep fried lake smelt and piri piri spiced chips. 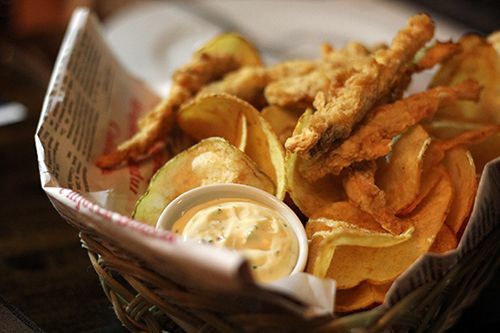 The fish were battered and fried to have a crisp coating, and the piri piri chips had a light seasoning to them. Fair warning though, the lake smelt are deep fried whole, so you chew on the small, edible bones with each bite. Unfortunately the fish and chips are not on the Seafood Festival menu, but Chef Lino will be featuring them once in a while throughout August. Next up was the beautiful Crudo Con Pebre ($24), featuring fresh Red Spring Salmon, Ahi Tuna, BC Coast Halibut, and BC Scallops. The raw seafood was topped with a simple combination of diced tomato, onion, garlic, cilantro, olive oil, and lemon which allowed the natural sweetness of each component to shine through. 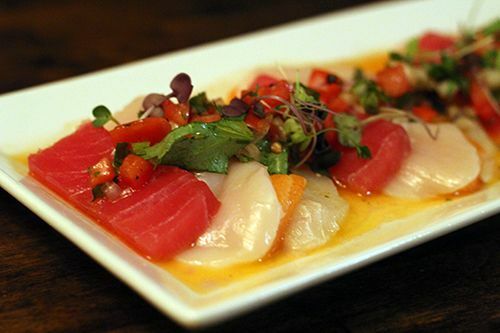 If you're a sashimi fan, this dish is for you. The following course was a Sardine Flatbread, paying tribute to Urbano Pizza Co. next door. 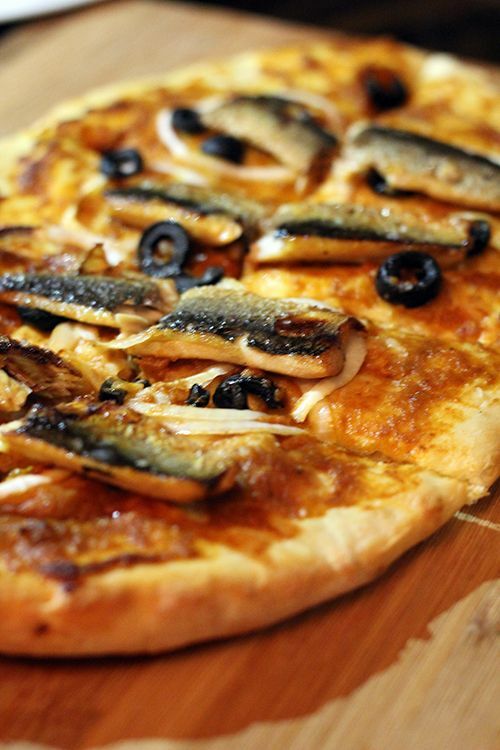 The flatbread was light and covered in a briny onion and anchovy spread that I could not stop eating. Combined with the black olives and portions of sardines, I quite enjoyed this course for the evening. Entrees that evening kicked off with Grilled Humboldt Squid & Prawns ($18) on a bed of chorizo and white bean puree. This squid, otherwise known as the Red Devil, was cooked until soft and very easy to chew. I personally prefer my squid with more bite and chew (like most Asians! ), so this dish may not be for everyone. What I really did enjoy though was the bean puree - rich, creamy, and with a kick of heat from the chorizo! 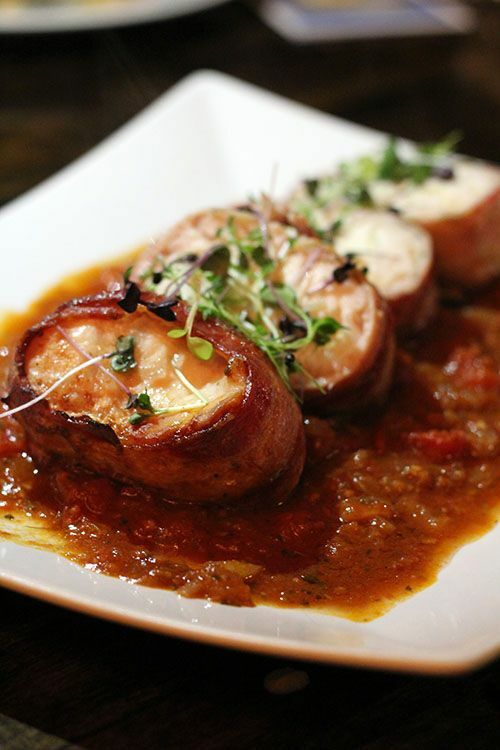 Despite having tried a wide variety of tasty seafood dishes, the star of the evening for me was the Bacon Wrapped Sturgeon on Puttanesca Sauce ($32). Sturgeon flesh is quite under-appreciated given that the prized caviar is what most people are after. It was great to see this fish as the star of the plate, and the firmer texture made for a substantial protein. There was smokiness from the bacon, salt and acidity from the sauce, and natural sweetness from the fish to bring everything together. To finish off our family style meal everyone was treated to Mama Margarita's Pudim Flan. 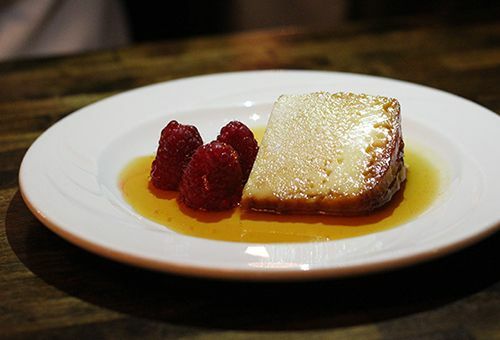 This flan is one of Chef Lino's favourite desserts made by his mother, and she finally caved and gave him the recipe. This Portuguese custard is creamy and sweet, and you can taste the richness of the eggs. Word on the street is that this custard is soon to become a gelato flavour at Urbano! 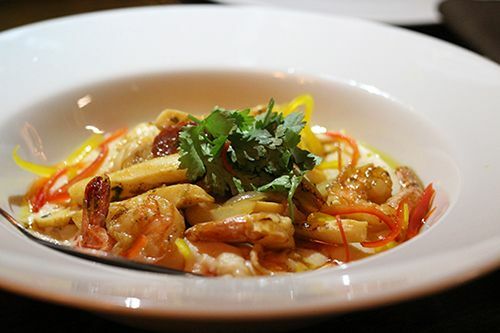 While Sabor serves up seafood on their menu throughout the year, the best time to enjoy all that the restaurant has to offer is during the seafood festival. 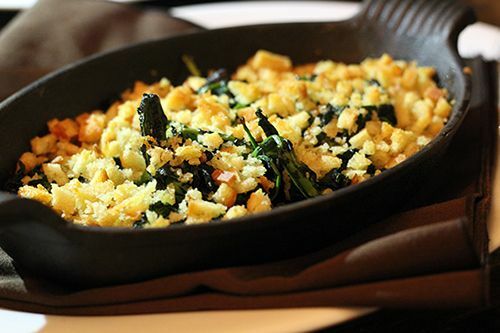 If you can't decide on a specific dish, Chef Lino is also offering off menu family-style dining at $55/person. It's great value and fun for the whole table! The seafood is fresh, the dishes are inventive, and best of all, everything is 100% Ocean Wise. What's stopping you? *Disclosure: Sabor invited me to attend their media tasting. Views expressed in this post are solely mine. I was not expected to feature this restaurant on my blog, nor obligated to do so. This post is 100% my opinion, and as always, my priority is to you, the reader, to present an unbiased, thorough review.